Inside the claustrophobic confines of a shipping container erected on an icy nowhere, a group of Russians waits out another day of an Arctic storm. Anton bakes blini. Andrei watches the same horror movie again. Alexei tries to craft a toothpaste holder from an empty tin can. Lisa the dog, who finds company among the 100 men in Camp No. 2, curls up farthest from the drafty door. The engineers gathered on this desolate patch of Russian tundra were hired by a geo-exploration company to look for oil deep below the permafrost. I am waiting out the battering winds with them, documenting the international race to domineer Arctic resources. I made six trips over three years to the Russian Arctic region, a 7,000 kilometer area atop the planet stretching from Finland to Alaska on which Moscow bureaucrats bestowed the name “Zone of Absolute Discomfort.” The icy hinterland is wretched to live in, but just hospitable enough to allow for the extraction of billions of tons of resources trapped beneath the permafrost. Here, three contrasting ways of life representing three centuries of Russian history simultaneously exploit resources amid the world’s harshest conditions. The extreme climate challenges indigenous reindeer herders known as Nenets; descendants of former Soviet prisoners; and energy company men seeking a rich cache of oil and natural gas under the frozen tundra. For hundreds of years, this part of the Russian Arctic was home only to the Nenets. When the Soviet government tried to force these nomads into collective farms, some were re-settled in apartment blocks, abruptly altering their way of life. Other Nenets escaped Soviet rule and remained on the tundra, raising reindeer for meat and benefiting from an uptick of demand for antlers, which are sold as aphrodisiacs in China. I sought my subjects via snowmobile, straining to see the Nenets chums (tents) and reindeer herds on the bleak horizon. My hosts welcomed me with a bowl of frozen whole reindeer brain, a Nenets delicacy. I next explored relationships in the Far North’s urban areas. Mounted jet aircraft stand sentry over cities used and abused by the Soviet government, and descendants of Stalin’s prisons populate the streets. Though the gulags were abandoned in the 1950s after Stalin’s death, many former inmates chose to stay. The Soviet government built housing blocks and communities for those who worked in the mines, and used high salaries to attract newcomers. The area boomed, for a while, but the regime scarred the once-pristine land with no regard for nature and sustainability. Now, pollutants shock the landscape and its inhabitants; in one town, sulfur rain kills all vegetation within kilometers of the mine. As I photographed this dying landscape, secret police followed me day and night, trying to discourage my efforts. I persevered in order to return with this shattering image of environmental horror. I try to convey through my photographs the result of political change in Russia. When the Soviet Union collapsed, the Russian republic neglected to support the towns and cities of the Arctic Circle, leaving people to languish in extreme conditions. The new government lost interest in the region and disregarded the infrastructure. Mines and factories closed, marking an entire generation in the Arctic region with poverty and alcoholism. Many flee to seek a future; those who stay often don’t work, age rapidly, and die young. As the final images in my series show, the Russian government is once again tempted to conquer the Far North, following Stalin’s failed experiment. In the last decade scientists discovered billions of tons of oil and gas trapped underneath the tundra, and Putin’s government commands Russian energy companies to usurp these resources and challenge gas-hungry European neighbours. New workers’ outposts, more nimble and modern, rise adjacent to the shell of old Soviet drill sites. Engineers and miners from around the world work short stints in the region, looking for natural wealth deposits three kilometers below the tundra. They come with expensive, sophisticated equipment and earn substantial sums for their hardship tour. It is the Nenets who must yield, as the Russian government has invested billions in energy exploration and asserted dominance over the region in 2007 by planting a titanium flag into the Arctic seabed. 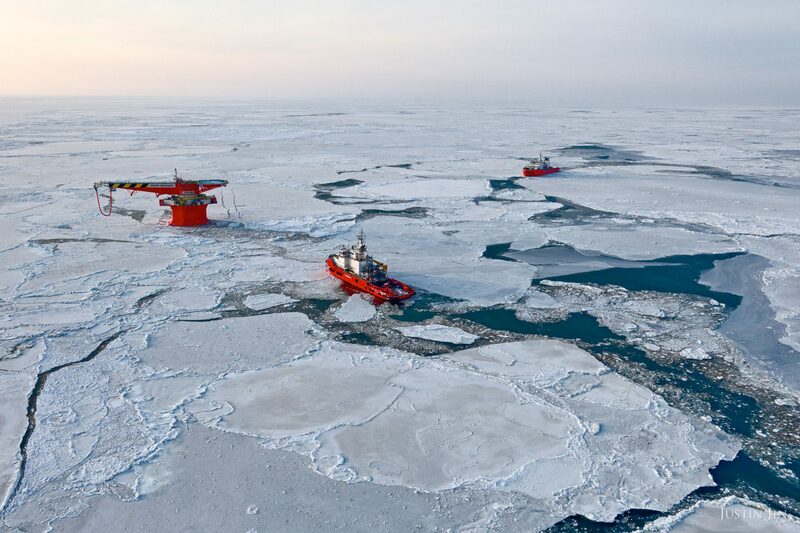 Ice-breaking ships circle the northern-most oil terminal in the world, near the North Pole, where global warming has opened an Arctic sea route in summer months. Within two decades, the government and mining companies predict, further warming will create a year-round ice-free route for container ships traveling between Asia and Europe. This crucial period in the Far North fascinated me so much that I did much of the groundwork myself, trudging for days in deep snow and pushing my body and my cameras to their limits. The Magnum Foundation recognized the relevance of this project and awarded funding for additional trips to the Far North. The Russian military granted me unprecedented access to photograph the extreme northern oil terminal from the air, but only after I repeatedly appealed over months to senior government officials and energy company CEOs. Our helicopter flew on the edge of the North Pole region, an area rich with resources prized by countries with an Arctic reach, like the USA and Canada, and even nations, like China, that simply thirst for oil. But behind the geopolitics are the individuals who eke out a life in this unforgiving desert. Back in the shipping container, Andrei and Alexei grow restless, and talk about their next opportunity to “strike gold” out on the ice. When the wind stills for a moment, the two grab towels and bolt for the makeshift sauna a few containers down the road. It is powered by pure Arctic diesel. The Zone of Absolute Discomfort was unveiled in September 2012 at Visa Pour L’Image, the world’s premier photojournalism festival in Perpignan, France. It won an Award of Excellence at the 2013 Pictures of the Year International (POYi).